I did. 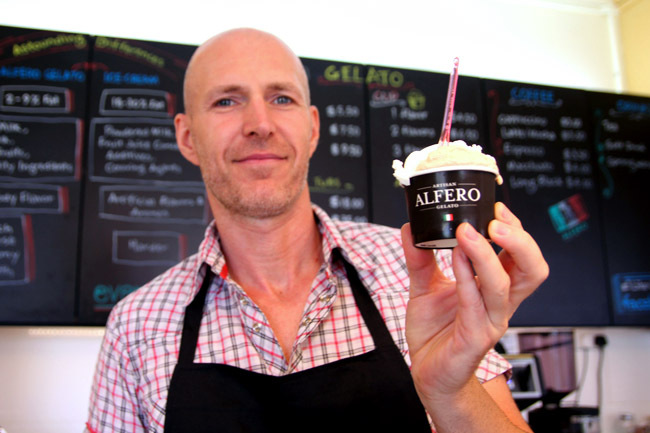 Upon reaching, the rather ulu Alfero Gelato was not easy to find – somewhere in the middle of some old housing estate next to a green field, though the district was rustic, peaceful and beyond charming. 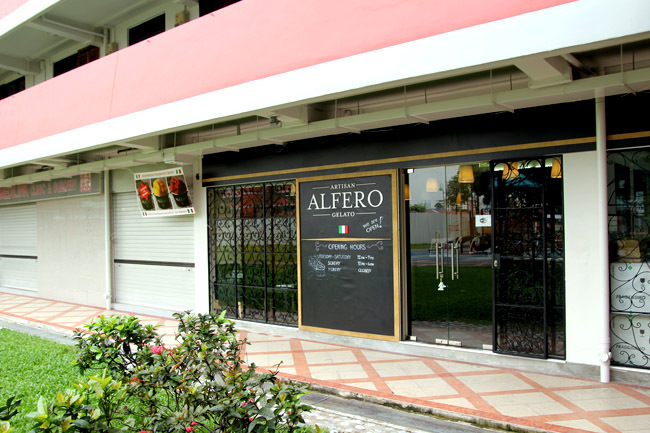 There is another branch of Alfero Artisan Gelato at a more convenient Marina Square, but MacPherson is where I can find the man himself – Marco Alfero. Since I am a fan of his gelato and described the texture as “creamy, rich, thick, smooth, heavenly”, I had meet its creator. Marco, how long have you been in Singapore for? I came from my hometown in Turin Italy since October 2009. I have been in Singapore for almost 3 years. Were you in the ice cream business all along in Italy? No, I was a finance manager in the semiconductor industry for more than 10 years. I hear you enrolled into an ice cream university. Did you get a Bachelor of Ice Cream or something? Haha, it was a certification programme with the famous Carpigiani Gelato University. They also produced the ice cream machine that I am using here. Very smart of them. They sell machines to their students! How is your Italian gelato different from the usual ice cream? 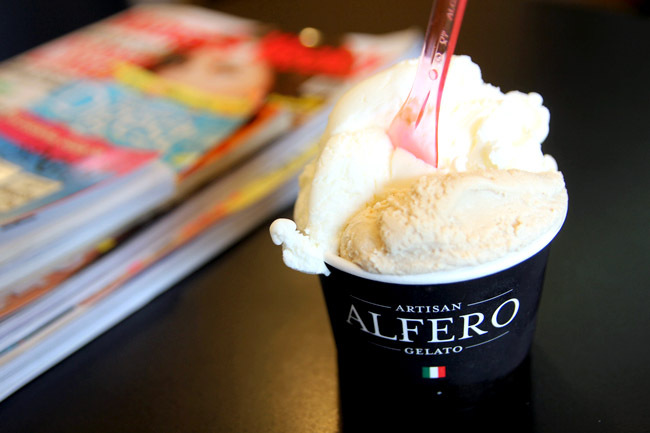 Alfero Gelato contains only 2-9% fat, as compared to 18-30% fat in normal ice cream. Also, we use only the freshest ingredients – fresh milk, egg yolks, real fruits and nuts from Italy. 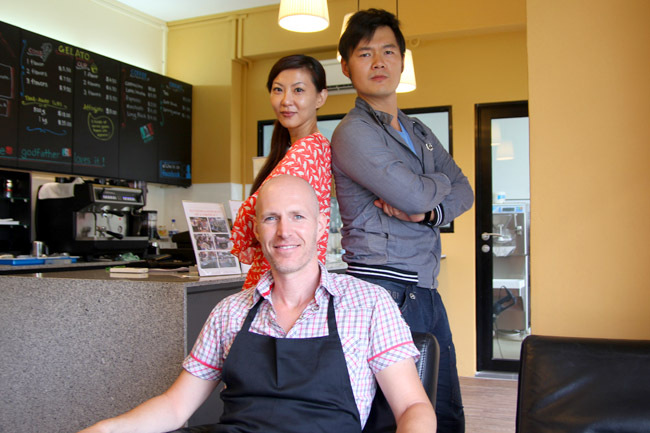 Have you tried other gelatos in Singapore? Of course, I am a fan of ice cream. But I feel they tend to be a little on the sweet side. Yes, I have realised Singaporeans do not like overly intense and sweet things. That’s why I modified the recipe so that is less sweet. Yours is the first cafe in Singapore to store your gelato in covered pozzettos containers. Yes, so that air and light do not affect the quality of the product. Customers used to wonder what I sell. Singaporeans are very visual people, and business was affected initially until they found out. Any thoughts of opening a 3rd branch? Yes, I am looking for a shop space now, probably by the end of this year. I told Marco I almost tried every flavour available already, my favourites being the nuttier Bacio (kiss), Nocciola (hazelnut) and pistachio. Its turns out he just created two new flavours – the Snow White (Milk) and Tiramisu ($6.50 for a 2 flavour cup). The Classic Tiramisu made with coffee, Marsala wine and Mascarpone cheese felt almost like I was eating the Tiramisu cake, only better because it was cold and creamy. While the Snow White felt a tad sweet initially, the simplicity of its flavour grew in me and you could appreciate the texture of the gelato on its own – truly the fairest of them all. Truly, 2 close friends of mine actually told me this is one of the better gelato they have tasted in SG and they don’t mind driving cos’ HDB carpark more affordable hahaha! I live in the area and I try to drop by everyday to have a cup. As you have mentioned, Macpherson is quite an ‘ulu’ area; I have seen many brands open in the area only to close down shortly because of poor reception and human traffic. 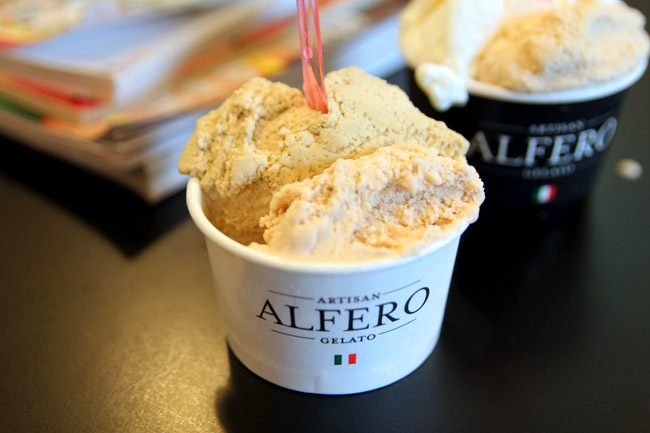 That is why I have committed to support Alfero Gelato so that they will stay here for good. Check out the video, Singapore’s first visual F&B showcase did for them on http://www.rolleyes.com.sg!